We present the results of studies of the nanocomposite MWCNTs/SnO2 hydrogen peroxide vapor sensors. The technology of manufacturing of these sensors has been developed. Because of the measurements of the temperature characteristics, the 100°C optimal operating temperature of the studied sensors has been found. The response and recovery curves of the sensors were investigated in the presence of different concentrations of hydrogen peroxide vapor in the atmosphere. A sufficiently high response was registered already at close to the threshold low concentrations of the target gas present in the air. In a double logarithmic scale, the linear dependence of the sensors response on the concentration of hydrogen peroxide vapor was observed in a certain concentration range. The minimal registered gas concentration is less than 1 ppm. Russian Text © Z.N. Adamyan, A.G. Sayunts, E.A. Khachaturyan, V.M. Araqelyan, V.M. 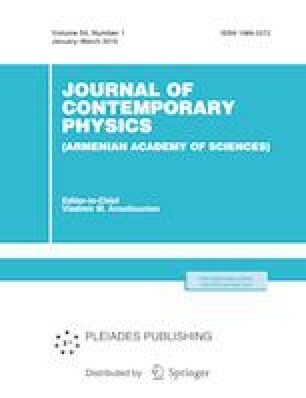 Aroutiounian, B. Joost, 2019, published in Izvestiya Natsional'noi Akademii Nauk Armenii, Fizika, 2019, Vol. 54, No. 1, pp. 75–84.